...obviously! Not sure exactly where I went wrong. The attempt order is a little screwy. My ring nail was my first try, then middle, index, and pinkie. The polish didn't spread out as much as I think it's supposed to, and I had a tough time dragging it. Once it was on the nail, there were these weird oily droplets on and under my nails. I have no clue what that was about. I tried two different cups, a few different poking objects (toothpicks and a straight pin), and four different polishes. Initially I thought maybe the two China Glaze shades I tried first were too thick, so I tried two Sally Hansen Xtreme Wears. Still no. Now I'm thinking that maybe it's too cold in here. Whatever it was...this is a failure, but not a defeat. I'll try again at some point...maybe when it's warmer. Something other than China Glaze though. Their polishes contain camphor. The vapors made me cough and I think it's why my fingers itched for a while after doing this. I'm more amused than discouraged. I've dubbed it a "water blorple", since it's really not a marble. The Beard said it looks like the backdrop in a fishtank. He's so right! It does. The end result looks really nice! 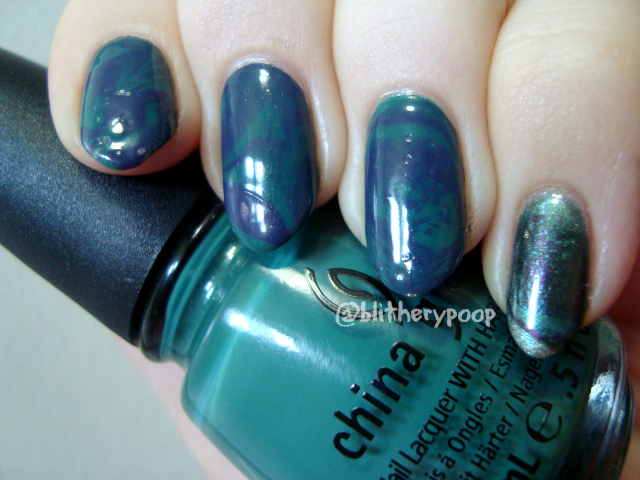 I read that polished that are quick-dry or contain hardeners (China Glaze) don't marble very well. OPI has worked well for me in the past, maybe because they don't dry too quickly and generally have a thinnish consistency. Also, maybe the fumes making you cough made the polish dry faster? Just a thought, but breathing into the cup can make the polish dry and drag. Good luck with your next attempt! Make sure you are using distilled water, it makes a huge difference. I've never water marbled in the winter, I would think the colder air would lengthen drying time? 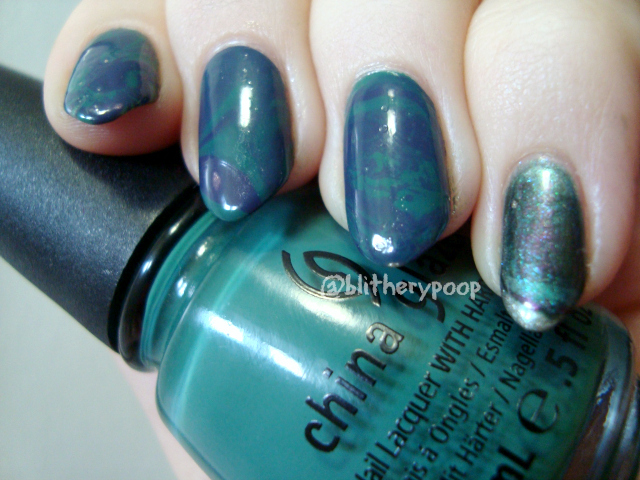 I used Sinful Colors when I was marbling all the time a few years ago, most of them worked really well :) hope that helps.